Chose any display and click on "Fullscreen" at the bottom right of its window. Once the screen opens, use the controls found at the bottom right corner of the screen to manipulate to document. Just one year after the first modern Olympic Marathon in Greece, Ashland played host to the "American Marathon" in 1897, kicking off an annual rite of spring now famous the world over. Read about the challenges and rigors of that inaugural race as well as why and how Ashland was chosen to launch its first start. The 1909 race, "The Inferno", was run under a blistering hot sun, starting out in 97-degree temperatures which knocked out more than half the field and cleared the way for a near-novice runner to beat the heat and break the tape. 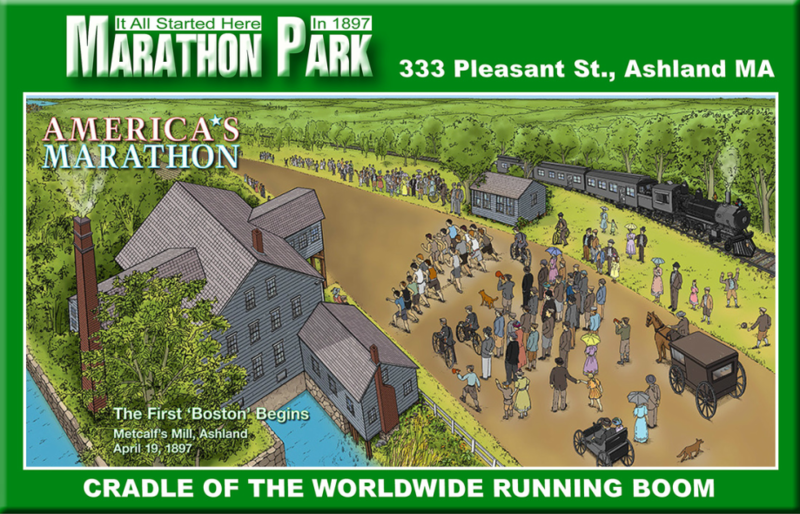 Also read a discription of the times and tenor of "The Ashland Era" explaining Marathon Park's iconic place in distance running history. Statistics from "The Ashland Era", including personal data capsules for the 27 champions, Ashland distance course record progression chart and the size of the 27 starting fields. Bonus Plaque: Top 10 finishers for first 27 races, with club affiliation and time as well as short bio on one of the many legends of "The Ashland Era." In 1901, Americans could legally gamble on anything that moved and the fifth marathon, like the four before it, attracted a rogue faction of gamblers, presaging an alleged fixing scandal in Ashland. Read all about that chaos and then peruse some vignettes of the wild and whacky happenings of "The Ashland Era." Clarence DeMar was a newspaper printer, a family man, a Sunday school teacher and a Boy Scout leader. He was also an immortal, standing among the titans of early 20th century sports, like Babe Ruth, Red Grange and Bill Tilden. He ran 33 "Bostons", winning seven, and finishing in the top three 11 times and the top ten 15 times. Amazing man, amazing story. Capsule summaries of the 27 races of "The Ashland Era" (1897-1923) that started at and around what is now Marathon Park; and a map and explanation of how and why the starting line moved around the neighborhood several times.